Before I even picked up this book, I thought that it was, well, a brave venture as In Their Own Words Derbyshire Cricketers in Conversation might be of interest to Derbyshire fans whose sides haven’t tasted as much success as others. Maybe, though, it will prove to be an inspired decision as Steve Dolman, author of award-winning and successful Peakfan Blog on Derbyshire cricket as well as a contributor to many magazines, is a big fan of the county and his love of it is very evident. When his work became known, many cricketers said that they would be prepared to talk and it naturally became a difficult choice who to include at the expense of which others. A broad cross-section of living people which is not confined to just players appears in this book and all were personally interviewed either in person or, in John Wright’s case, by Skype. The format is a reproduction of the interview with a question and answer style and comes over well. The book starts with 99-year-old former groundsman, Walter Goodyear, and ends with current Chairman, Chris Grant, whilst the main section features cricketers from 1951 to the present day. Those interviewed within the same era and whose careers coincided with some of the Derbyshire greats, Cliff Gladwin and Les Jackson to name but two, have their own views and memories of not only these two fine cricketers but others which make it even more interesting. 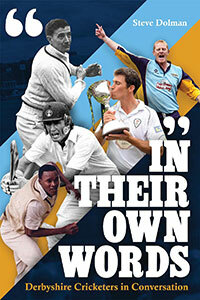 Readers will doubtless know of the international cricketers interviewed including Bob Taylor, Devon Malcolm, Geoff Miller and John Wright whilst, moving into the 21st Century, Kevin Dean and Graeme Welch will be remembered as Derbyshire stalwarts. It is slightly sad for the timing of the book that Graeme Welch has just resigned his position from the club but, hey ho, it happens but all interviewees come over well and one senses that they enjoyed their run with the club. On a personal level, I have not only learnt much about Derbyshire cricket but thoroughly enjoyed In Their Own Words and congratulate Steve Dolman on his engaging book. I will be the first to admit that my knowledge of the Peak District county club was not my strongest point but I have certainly found out more, enjoyed it and hope that other readers will read it and I wish Steve every success with it.